Mauretania, maiden departure or a ship very advanced for her time, “A blaze of electric lights”. At 20.30 hours on the 16th of November 1907, we witness the maiden departure of the Mauretania from Liverpool bound for New York. I researched, I still have my notes and my copy of ‘Mauretania, Engineering’. It was soon clear, Mauretania and her sisters were very advanced ships for their time including being fitted with the first large Parson’s steam turbine engines. While diligently researching Mauretania I also delved into the archives at Liverpool. I was much encouraged by the late editor of ‘Sea Breezes‘, Harry Milsom whom I met in his office in Liverpool. My client and I discussed my findings. I’ve only painted Mauretania twice, this, the first for a gentleman who collects liner paintings and specifically wanted and example of a ‘Gordon Frickers’. We settled for “Mauretania, Maiden Departure”. 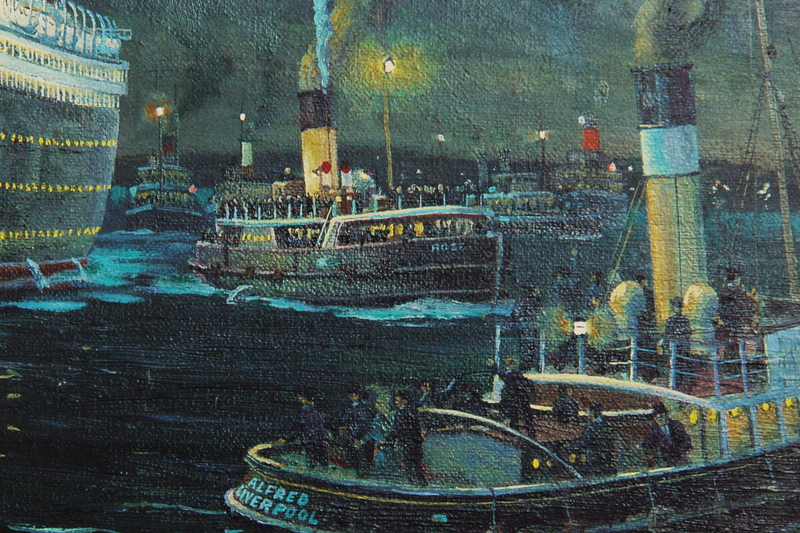 “A blaze of electric lights” was how she was described, that at a time when electricity was the ‘coming thing’. Less obvious, she and her sister RMS Lusitania were fitted with by far the largest versions to date of a revolutionary [in more than one sense] engine, the Parson’s Steam Turbine. All the small craft in this painting existed and are known to have been present on that grand occasion. A very few copies available of the print are still available, signed numbered print, £157 inc P&P. Timeless paintings, the test of true greatness. 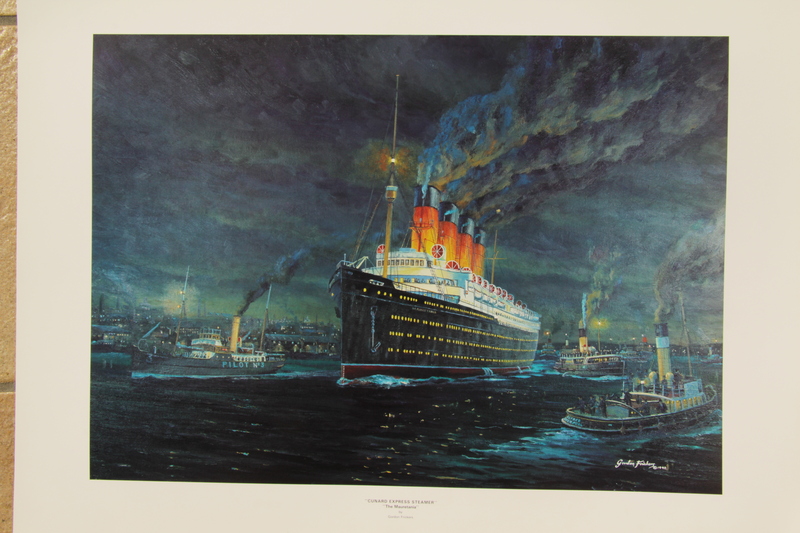 A meticulously researched painting, early pictures of the famous Mauretania are very rare. Mauretania was the world’s largest ship until the completion of RMS Olympic in 1911, sister to the ill fated ‘Titanic‘. 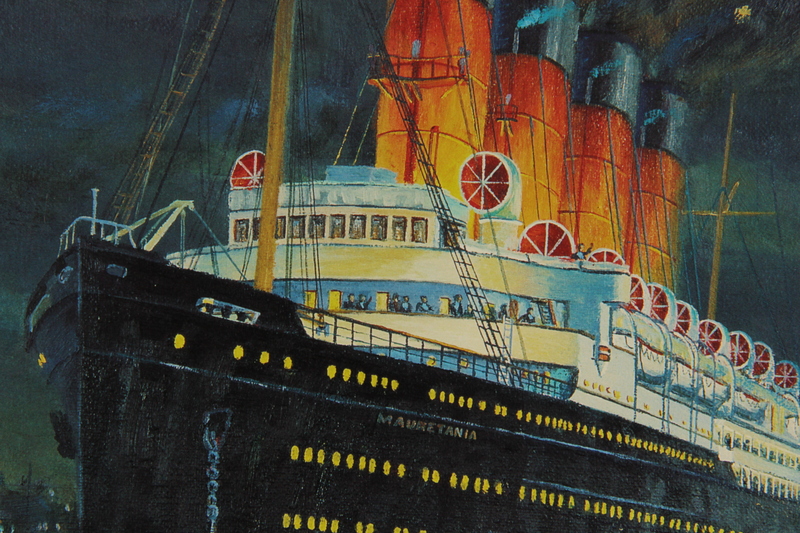 Mauretania was the fastest liner in the world for over 22 years until finally overtaken by the ‘Bremen‘s maiden. Mauretania had a long and successful life. 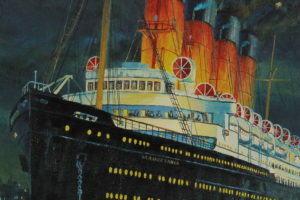 Mauretania became a favourite among her passengers. Mauretania a great and gallant ship. My second Mauretania painting showing her in Plymouth Sound was completed back in 1992. It was a small painting which quickly sold. built by Swan, Hunter & Wigham Richardson on the Tyneside, , designed by Leonard Peskett for the British Cunard Line, she was launched on the afternoon of 20 September 1906. As was Cunard’s custom at that time, the ship’s name was taken from Mauretania, an ancient Roman province on the northwest African coast, not to be confused with the modern Mauritania. When I sailed as a celebrity guest on the ‘Queen Elizabeth 2‘ I saw QE 2 had a beautiful restaurant named after Mauretania which included a large model of the famous lady. About Mauretania was LOA 240 m, Designed speed 24 knots, that is 44 km/h; 28 mph. Mauretania entered Cunard Line service 16 November 1907 about a year after her sister ship Lucitania. Her usual crew numbered 802, usual route Southampton–Cobh–New York City, sometimes called at Liverpool and Plymouth. Eventually painted white and used as a cruise ship, she was retired sent to breakers 1934. Her sister Lusitania made 202 crossing before she sunk was without warning. She was officially a non-military ship, torpedoed by U 20 off the Old Head of Kinsale. 128 American citizens were among the dead. 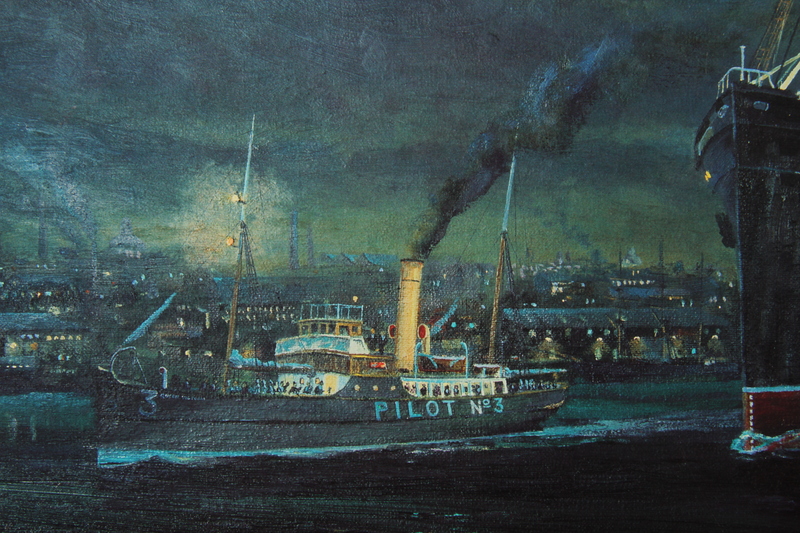 The sinking caused a storm of protest in the United States. 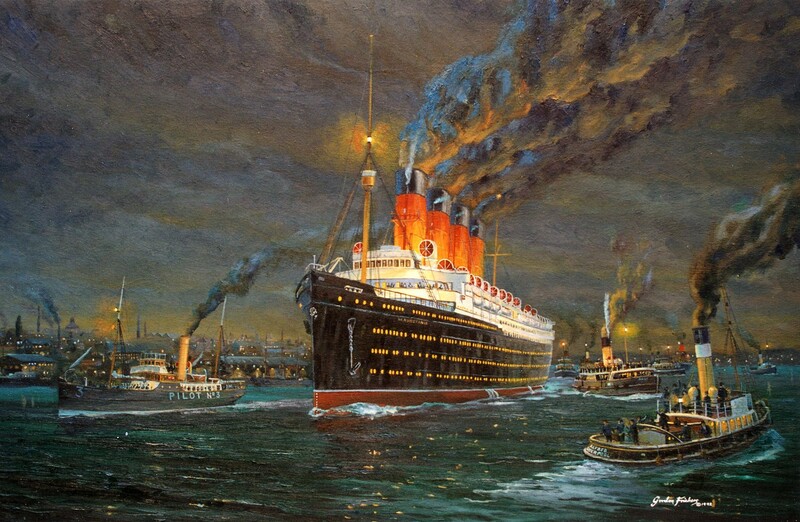 That sinking helped shift public opinion in the United States against Germany. You’d like a print or to commission a similar painting?